Many people look back at childhood summer memories with a lot of fondness. These memories usually involve swimming on hot summer days with friends and family. You can now give your children and frankly, yourself as well, the ultimate summer hangout spot right on your own backyard. With our modern methods and love for custom designs for each unique project, your role is to dream and envision the best pool you can think of. Ours is to take up the challenge and create you the best pool design you can get. You may have just purchased a new home and found the old pool in a terrible state. Most times, all it takes is an overhaul of the finishes and repair of the pool systems to give the forgotten pool new life. Adding incredible tilework and new surrounding pavers will bring the pool design into your personal style preference. You can transform rundown pools into a beautifully refreshing getaway in your backyard. When thinking of a great design for your home, do not limit yourself to basic shapes and cliché cookie cutter styles. You can add some extra features such as this lovely rock garden. Not only does it add levels to this yard, it also creates a calming ambience with the natural look added by the rocks. This completes the look of the yard and makes is look more curated. The relaxing sounds of flowing water will make it a popular destination in all your house parties. We create customized designs to suit different client needs. All you need is to dream big and let us make it realized. Nothing compliments a beautifully designed pool like a well thought out patio area. Patios are a huge part of the completed design because they provide seating when the pool is not in use. They also act as extra seating where you can entertain guests for an afternoon cup of tea or simply sit out and read a book. Our patio designs range in style from modern designs to classic and eclectic mixes. 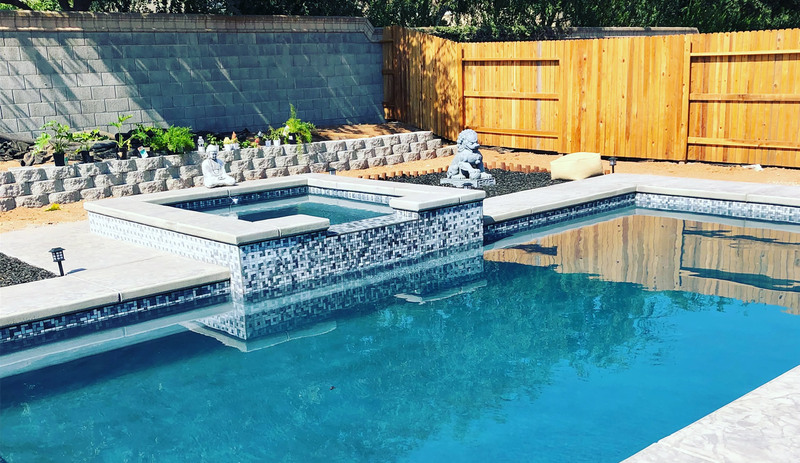 If you have a preferred design style, our team will work hand in hand with you throughout the construction process to create your dream poolside seating. With features such as a fire pit, nothing is out of question. New ideas challenge our abilities and enable you to get the best experience you can imagine. Spillways are structures that allow controlled release of water that flows continuously into your pool. Adding this feature to your pool design takes the entire look one step further and creates drama and definition to a pool design. We can add several spill ways in a pool design or create a cascading group of spillways. Whatever spillway design ideas you have can be incorporated into your custom pool design. Gone are the days when hilly terrains and irregularly shaped yards were a limiting factor to pool design. Challenging landscapes often provide the opportunity for gorgeous infinity edge designs. Enjoy a pool design that draws your eyes into the far horizon and dramatically adds a beautiful visual effect of boundary less pool edges. This kind of luxurious design need not only be in hotels and resorts. You can add a gorgeous infinity edge design to your pool right at home. How about a pool party where you sit and watch as your family makes gourmet burgers and have the served without ever leaving the pool. We can incorporate a sophisticated design in your pool that will not only add a beautiful destination in your yard, it will also serve as a culinary inspiration. Adding a grilling space to your pool design allows you to get more function for the features in your yard design. Modern finishes and addition of lighting will take the design to a new level and allow your family and guests an unforgettable experience. It also allows for night time use and let’s admit it, your well-lit pool will make your yard a gorgeous romantic getaway every night. No need for expensive date night dinners if you can create an experience in your backyard. Nothing suits a family pool more than the safe and beautiful beach entry to a pool. Eliminate the steps and the child safe gradual slope that runs from the pools edge and gradually slopes into the water. This design allows for a shallow area that is a perfect spot to relax and get a tan and little kids can safely play without fear of accidents. This feature not only looks gorgeous, it also serves a great function in the entirety of your pool design.